Years ago when I first began plotting a visit to Zagreb, Croatia, I went into heavy research mode. The simple fact is this: I view a city through the prism of their approach to coffee, beer and whatever regional food specialty that is offered. I quickly discovered that Croatians are passionate about coffee consuming over 5 kilos per person, per annum. Back in USA we’re a more moderate lot guzzling just over 4 kilos per American. Nik Orosi, the national champion barista of Croatia, is the king of coffee culture in Zagreb, the nation’s capital. During the ramp up to the trip I mentioned my travel plans to coffee obsessed friends and they all swooned. “You must go to Eli’s Caffe, the man there really knows what he’s doing. Walking into the tiny cafe on busy Ilica, a thoroughfare that bisects Zagreb from west to east, is like walking onto the set of Gattaca. It’s jarringly white. White wall, white floors and white ceiling all combine to create a purity of space that is rare and soothing. I manage to score a bar seat in the packed house and announce that I’m here for Croatia’s best coffee. Orosi smiles modestly and sets about making me a coffee drink I haven’t had in years; a cappuccino. 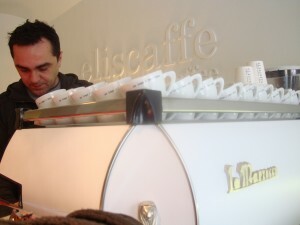 We discuss coffee culture in USA vs Croatia as he dials in his fancy La Marzocco espresso machine. He’s hustling out the shots, all the while maintaining a dialogue explaining his philosophy on serving the best coffee in the thriving metropolis of Zagreb. Most importantly, he only sources the best of the season’s beans and roasts them himself at a facility he owns a few blocks away from Eli’s. This is the nexus of Orosi’s business, his ability to control the flavor of each cup of coffee that he vends from the most primal of levels. We talk about the current vogue of stuffiness in American coffee culture. Baristas who dress like characters from British novels with high collared shirts, garters on their sleeves and winkle picker shoes-who spout aphorisms about the importance of some obscure bit of coffee arcana or the other. Orosi sniffs at such nonsense. He feels it drives people away from the real point of the affair, drinking the best coffee available and doing so in season. He must be doing something right. The little shop is wall to wall people. An elderly woman in 4” Prada heels, a young mom dressed to the nines with toddler in tow, an ancient hawk-billed Croat in a watchmen cap-it’s a very diverse scene. The coffee is superb. I normally take my cup black but Orosi’s cappuccino may have me rethinking my morning starter. The next morning I stroll in and my heart sinks. Nik is gone. The counter girl explains that he’s working at the roaster and won’t be in. I roll the dice and get a cappucino from the barista who’s filling Orosi’s shoes for the day. Outstanding. Marij must have undergone some extensive training prior to being turned loose on the La Marzocco as her cup is virtually indistinguishable from Nik’s. A woman seats herself next to me at the bar and we engage in a spirited discussion on the current state of Dalmatian cuisine, there’s not a laptop in sight, the conversation flows along with the coffee and all is right with the world on this glorious day at Eli’s Caffe in beautiful downtown Zagreb, Croatia. 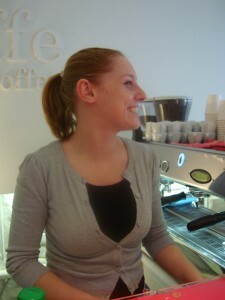 This entry was posted in Zagreb Croatia and tagged coffee, Hrvatska, Zagreb Croatia. Bookmark the permalink. I believe Nik Orosi, champion barista of Croatia, is competing in another challenge in Vienna soon.